It seems that Japan’s love for the long-running detective anime has not waned, as Detective Conan: Fist of the Blue Sapphire, has already earned nearly 1.9 billion yen (about $16.85 million) in just the 1st three days of its release! The film also debuted at #1 in the Japanese box office during its opening weekend of April 13-14. 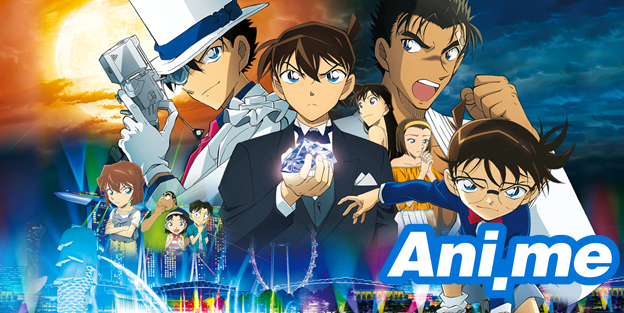 This record number already makes Fist of the Blue Sapphire the highest-earning movie in the Detective Conan franchise, surpassing the earnings of the previous film, Detective Conan: Zero the Enforcer. The latter earned 1.67 billion yen in its first three days, and eventually became the 8th highest-grossing anime film in Japan. The film was also released in cinemas outside Japan, earning it a worldwide total of 11 billion yen. Fist of the Blue Sapphire is the first in the franchise that will be set outside of Japan. Singapore’s famous Marina Bay Sands will be featured in the movie as the site of a murder case. Kaito Kid’s much-coveted Blue Sapphire, which was said to have sunk to the bottom of the ocean, will also figure prominently in the story. This film marks the first appearance of karate master Makoto Kyogoku in the films, as he confronts Kid for trying to steal the Blue Sapphire. Kaito Kid, on the other hand, drags Conan to Singapore against his will. This movie marks Kaito Kid’s return to Detective Conan films since 2015’s Sunflowers of Inferno, the franchise’s 19th film.